Pattern stitch is a multiple of 14 - useful if you want to increase the length of the cowl. Cowl is worked flat - textured stitches on one side while the other side is smooth. 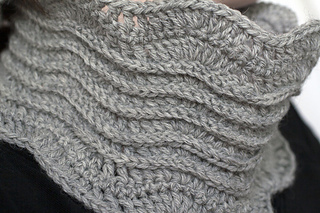 If you don’t like it as a cowl, you can always add stitches in a multiple of 14 and create a scarf for yourself. Model is stitched in one color, but you can easily adapt the pattern to add an additional color for the post stitches to create contrast.